As each guest boarded, cheers ALWAYS broke out, welcoming a new VOICE to the chaos!! And, Captain Scotty loved every moment of it! Riley, at 14.5 yrs, was now thoroughly enjoying his ELDER status, and had set himself up quite comfortably in the large, luxury lounge area, just behind the cockpit. Here, Riley was convinced, the plush lounge chairs were SOFTER, the stereo speakers had more resonance, the carpet was thicker, and..... MOST importantly, he could reach the bar refrigerator, containing ALLLLL the treats & yummies for the flight, simply by leaning WAY over and pulling on the knotted kitchen towel he'd attached to the refrigerator handle. Gradually, as the ScotCorde made its rounds, Riley's group of Elders grew... Truman H. arrived and immediately selected JUST the right lounge chair, close enough to have Riley HAND him any treat he desired. Mayzie & Angus H joined the venerable group, followed closely by Noots and Gyppsy Rose Kitty. Riley noticed the moment D'Arcy M. stepped onto the plane. As she moved to walk past Riley to take a seat farther back, he reached forward and took her paw in his. She stopped in her tracks. "My dear D'Arcy, would you honor us with your presence? Our conversations would be greatly enhanced with the addition of your starlit eyes and lilting voice......." With a charasmatic smile, he gently pulled her into the group. D'Arcy smiled broadly, then greeted each member of the group, before settling down next to Riley. The conversation soon grew spirited as the group shared their vast memories of past BASH adventures. A large crowd gathered, all eager to hear the tales from those who'd BEEN there and EXPERIENCED the events first hand. Meanwhile, Captain Scotty had noticed a growing problem. The Guardians were having difficulty with several of the younger travelers. At each stop, everyone rose to greet the newcomers, with much fanfare and noisy celebration. The problem was getting the crowd BACK into their seats for each take-off! Captain Scotty had let the first take-off slide, as the guests were experienced, more 'seasoned' travelers. NOW, the younger, more exuberant fur-guests were pushing the envelope... dawdling, stalling... after each arrival, in order to "NOT" be buckled up for the next take-off. Hans, Alice, and Clio had their paws full trying to ENFORCE the 'take-off/seatbelt' rule. Mac D.C., Piper B., Callie H., Alanagh W., and Caiti N. adamantly refused to sit down. They dodged and darted, hopped over chairs, as they avoided the Guardians. Giggling and dancing, they held up their paws, waiting, waiting.... until they were forced to grab the nearest chairback as the ScotCorde gaining altitude. The entire purpose of this game, it seemed, was simply to see who could stand in the aisle longest withOUT grabbing a nearby chair!! At the next pick-up, the Guardians 'accidentally' blocked the aisle next to the youngsters, effectively pinning the willful jokesters into a tight wad. The youngsters took the defeat gracefully, even nodding graciously in answer to Clio's raised chin and slight smirk.
" Tie ...... 1 - 1!" Mac announced. With a flourish, he swung around, turning his back to the Guardians. "Watch that next time, guys, it'll be a hum dinger!" Callie, Piper, Alanagh, and Caiti laughed... then went into a huddle, to PLAN the next take-off. Captain Scotty, hearing the conversation, stepped into the cabin, and moved to lean over and whisper into Riley's ear. Riley sat up straighter, turned, and glanced back down the cabin. He looked back at Captain Scotty and nodded. Riley slowly made his way back down the wide aisle. As he passed Vangie and Hunter and their group of noisy friends, he leaned down and whispered quickly. She nodded, and watched as he slowly made his way back to stand beside Hans and Clio. He spoke quickly, gestured back down the aisle, then gave the Guardians a final nod. As Riley slowly sauntered back up the aisle, he seemed to leisurely stop and greet friends on both sides of the aisle, patting several on the shoulder, smiling at each friend as he passed... and always whispering, that furtive, 'share a secret' whisper. Reaching the Elders again, Riley leaned over and quickly whispered to the group. Huge smiles broke out on the Elders' faces, heads popped up, glancing back down the aisle. The youngsters, ready for the next take-off, were focused on THEIR plan. They didn't notice the Guardians, working feverishly at the far end of the aisle. They didn't notice the heads popped up on both sides of the aisle, ears erect, watching! As the next arrivals, Monte, Mochreigh, Malleagh, Morley, Misti, Maddie, Millie, Motley, Mitzi, Rocky R, stepped onto the jet, their friends quickly pulled them into the nearest available seats. Hurried whispers were exchanged.... everyone watched. Riley turned in his seat, glanced back down the aisle at Hans... and nodded. Turning back, Riley looked forward, to the cockpit. He exchanged a look with Captain Scotty, then settled back into his seat. Everyone heard the change in the engines. Everyone felt the huge jet 'shuddering' from the restraint. They glanced back down the aisle to the youngsters, standing in the aisles, feet widely braced, waiting excitedly. Captain Scotty held the huge jet immobile. The engines were straining. He could feel the power beneath his hands. He had no need to glance back, he knew the Guardians had the situation well in hand. If the youngsters wanted a 'thrill' take-off, who was HE to deny them!!?!!? With a wicked grin, he released the brakes on the ScotCorde. Everything happened at once.... the jet leaped forward, and immediately aimed skyward. The steep ascent was surprising, even for those who'd EXPECTED it... the sharp angle threw everyone back into their seats. Down the center aisle, however, the world had definitely turned upside down! The sudden sharp upward angle threw Caiti completely off her paws. She desperately grabbed for the nearest chair, but merely succeeded in flying backward into Mac, who'd braced his rear legs wide apart, with one paw anchored against a bolted chair leg. The full force of Caiti's momentum caught Mac right in the chest, throwing HIM flat onto his back as he landed on Alanagh, who had both front paws wrapped tightly around the legs of whoever was seated in 14C. Callie was leaning well forward, still had her footing, and had wedged her rear paws against the doorway to the aft galley. One front paw was still overhead, the other paw had a death grip on Piper, who was completely airborne. Reaching altitude, Captain Scotty leveled out..... which immediately sent the entire group into one massive pile in the middle of the aisle. All anyone could see, furry bodies with paws and tails and noses... all wadded up together. "WHEEEEEEEEEEE!! That was AWESOME!! Let's go AGAIN!" Callie shouted, gleefully. Alice and Hans walked up the aisle. They'd placed themselves at the far end of the aisle, along with some cushions, in case any of the adventurers had rolled all the way to the back. Captain Scotty checked his passengers. Everyone was smiling, boasting, and begging him to do it again. A glance toward the Guardians drew a 'fine with us' shrug..... so back to the cockpit he headed. The next half hour consisted of a 'roller coaster' flight, earning squeals, shrieks, and more than a few GRUNTS and WOOFS as EVERYONE joined in! 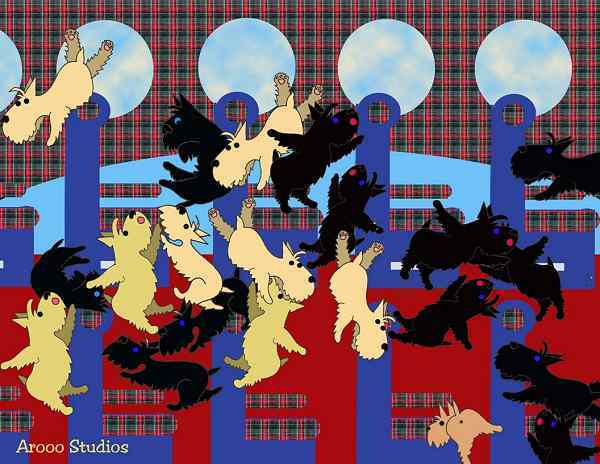 Finally settling into a leisurely flight, the Scotties grew more and more eager to reach their destination. Vangie, Scarlett, Cher Bear, Bijou, Kala, Brindie, and Maggie B. started a fashion show up and down the aisle, pivoting and turning to show off their new swimsuits. It Austin Bad Pup and Mason B. who turned the fashion show into a TOWEL fight... they'd twirled up the towels, and had 'popped' the towels mere inches from the 'models' as they turned back up the aisle. Vangie, having none of that, immediately grabbed the end of a 'popping' towel, almost pulling Austin off his feet! Scarlett raced over to help Vangie, and within seconds, 6 Scotties were claiming ONE, quickly ripping towel..... with the accompanying growls, death shakes, and bruffs that accompany ANY Terrier tug of war!!! The rest of the flight was filled with laughter, as friendships were renewed, tales were shared... time passed in happy companionship. "All right, Adventurers. If you'll look out your windows you'll see your first destination.... your beach party awaits..."
Captain Scotty let his eyes wander, just for a second, as the ScotCorde descended toward the runway. He never tired of this view, picture postcard exquisite! He smiled. This would be a VERY nice trip! Back in the Main Lounge, Gromit, Maggie B., Happy Jack, Scarlett W., Striker M., Jaimie S., Ziggy Stardust (c@t), and Hot Rod all seemed to hop up simultaneously. They'd had their noses plastered to the windows as the Scotcorde had landed, and had apparently seen something that 'struck their fancy'! They were into the aisle, speeding toward the door, with Lady, Quinn, and Bella hot on their heels. "Hold on, there," Lady warned. "Patience!" Vangie made her way up the aisle, climbed up onto a serving table, and ARRROOOO'd, long and loud. Applause broke out among the Terriers, some replying in kind, creating intensely noisy chaos. The Guardians looked at each other and shrugged. Alice mouthed "wait it out".... and the Guardians leaned back, got comfortable, and tried to tune OUT the bedlam. Finally satisfied, Vangie held up her paws, and the group quickly quieted. "We're here for the week-end," Vangie announced. "We're going to celebrate Summer here, with a Beach Party that will become the stuff of LEGEND!!!" Vangie's paw went up again. "We're going to SWIMMMMMMMMM........", she announced with a flourish. Wild cheering broke out....... again! "We're going to EATTTTTTTTTT..........", she announced, patting her tummy. Wild cheering broke out...... again. "We're going to build a Beach bonfire, cook marshmallows, and steam clams!" she shouted gleefully. Wild cheering broke out..... again. "Are you READY for a BEACH PARTY to END all Beach parties????" she asked, definitely stirring the pot. Wild cheering broke out....this time, accompanied by the entire throng of Terriers scrambling into the aisle, all headed toward the door. "Get UP THERE!" Hans shouted to the Guardians. "NOW!!" Jeb reacted first, taking his route UP and onto the shoulders of the Terriers. He scrambled atop the crowd, speeding up the aisle. Reaching the doorway, he leaped through the door, and sped down the stairs. Behind him, Alice and Clio hurried through the crowd, finally making their way to the front of the Terriers. 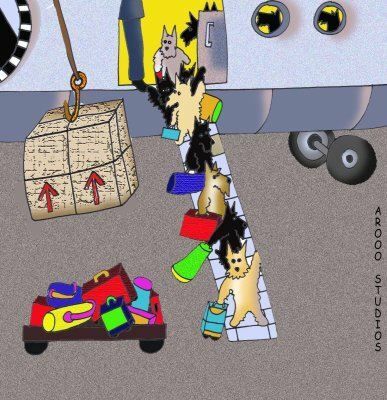 It was a chaotic 10 minutes before the Guardians had the herd of excited Terriers rounded up, had sent them BACK into the jet to gather their luggage and carry-on bags, and reassembled beside the great jet to await the busses! "HEY, LOOK!" exclaimed Lucytu. "LOOK at the airport signs! NONE are in ENGLISH! NONE of them!!" Everyone began excitedly looking about, seeing things now with a different attitude... ADVENTURE! It was then that Tana started looking around, counting heads, searching the crowd. She stood up straighter... looking. Nope, they weren't here. Turning to Hans, Tana quickly reported, "That group so eager to exit.... Gromit, Maggie B., Happy Jack, Scarlett W.,Striker M., Jaimie S., Ziggy Stardust, and Hot Rod..... they're ALLL missing. Gone...... ALL OF THEM!!" The Guardians were assessing the situation, double checking the list..... yes, they were short.... not 8.. but 9 !!! Clio spotted it first. "Never fear," she announced with a smirk. "The Eager 8 are being chaperoned!! JEB is missing, too! They have a GUARDIAN with them!" The BASH guests were milling around on the tarmac, next to the ScotCorde.... whispering excitedly in small groups. "Where'd they GO? ", Kala asked. "Can't believe they RAN AWAY!!" Gunny announced, stunned. "They were PUP-napped!" Hobbes D. shouted!! As the minutes passed, the rumors grew... emergency trip to Woobidoor... ran off to join Pup-in-dales... went to pick up pizzas?!?!?! Laughter broke out at each explanation, more ridiculous than the last. Riley appeared at the top of the 'airstairs'.... pausing in the doorway, for effect! Vangie spotted him, KNEW that look, knew he was about to speak. She turned to the crowd, and directed their attention up the stairs, to where "Mr Suave" was waiting. Riley stepped out, placed one paw on the railing, and addressed his friends. "Captain Scotty has taken care of the situation with the Missing 8 + 1. He has their GPS coordinates, he has dispatched a couple of his Air Force pals to keep an eye on them. They'll be fine..... until they get back here for Captain Scotty's "talk"....."
"COOL..... then, LET'S GET ON WITH THE BEACH PARTY!!" shouted Megan Daisy W. Cheers of approval rang out. "Now............ where ARE WE?????????? WHERE'S the beach?????????" Megan demanded. Captain Scotty stepped up behind Riley and smiled down to the Terriers. Spreading his arms wide, he announced, "My dear Terriers..... you've arrived at the GREATEST place on EARTH to have a BEACH PARTY!!" "WELCOME TO THE FRENCH RIVIERA!!!!!!!!!!!!!" "Now, come ON!! We have a BEACH PARTY calling our names...... EUROPEAN style!!!" Vangie leaped off the 'airstairs', trotted across the tarmac toward one of the 3-dozen stretch limousines that were waiting. She grabbed Hunter's paw as she passed, and together, they sprinted toward a Limo. Immediately, 90+ BASH guests stampeded, all toward the flashy, classy Limos. FRENCH RIVIERA BEACH!!! WOW, the possibilities!!! WOW!!! FUN, FUN, FUN... this was going to be FUN!! Back at the ScotCorde, Riley stepped back inside, and motioned for his Elder pals. Together, they slowly descended the stairs. JUST as they reached the tarmac, THEIR ride arrived..... pulling up RIGHT beside the stairway, to eliminate any need for extensive walking. The Elders were duly impressed. 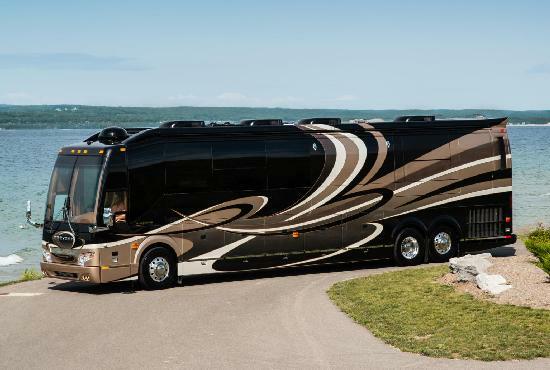 In front of them was a custom-built RV, black, taupe, and chrome... with graceful swirls weaving its way down the length of the enormous coach. "NOOOOOO sense in having to ROUGH IT," he smirked, as he offered his paw to D'Arcy to help her up the stairs into the coach. As the Elders settled into the plush seats, staffers immediately stepped up to offer them drinks and pastries, served on sterling trays. The driver eased the RV forward, smoothly gaining speed, to provide his guests with the MOST luxurious ride to the Beach. Three dozen stretch limousines pulled to the curb. Even here in Cannes, on the French Riviera, it was HIGHLY unusual to see 36 limousines, not to mention the nearly 100 Terriers and fur-friends that piled OUT of the vehicles. "The beach AWAITS!" Vangie called as she led the way toward the surf. Squeals of glee, peals of laughter, happy fur-kids reveled in the bright sun, the warm sand, the azure sky and the turquoise blue waters.. picture postcard FUN!! Rocket, Tiger, Bruiser, and Lane stood in open-mouthed amazement... their FIRST BASH, and here they were, on the FRENCH RIVIERA... amazing! Rocket nudged Tiger, then kicked sand onto Bruiser's feet... Bruiser wheeled around, and returned the favor. Lane tried to stay OUT of the fray, but that didn't work, either... as Holly D. raced up, pivoting at the last minute, sending a 'rooster tail' of sand into their faces. "TAG!! You're IT!" Holly called, as she sped off down the beach..... Rocket, Bruiser, Tiger, and Lane hot on her trail. Sunny R. saw this as just too good to pass up, and fell in behind, turning the chase, into a RACE. Carleigh went flying around Jack McD, who immediately took up the challenge. Alice and Bella took up positions to keep an eye on the impromptu beach race.... which was quickly attracting more and more Terriers.... competitors that they are! Archie B. was running stride for stride beside Rory K.... which was fine, until one of them (not saying WHO) 'smiled' at the other, showing a glimpse of teeth. Pushing and bumping followed, as the two increased speed... focusing more on their competitor than on the beach ahead of them. None of the runners saw, ahead of them, a lesson in 'sand momentum' taking place. Angus & Piper B, along with Tana L. and Odie, were showing the NEWEST species to attend a BASH...... PEPPO the Land Hermit CRAB, to sand !!! Peppo, it seemed, was unfamiliar with sand, having spent his life in an aquarium. Rory spotted the group first, kneeling down, all focusing on something on the beach. He tried to side-step the group, but ran into Archie, who stumbled into Carleigh and Sunny. This created a domino effect, throwing the entire gang of runners off balance..... 'all fall down' !! Piper, Tana, Odie, and Angus immediately placed themselves over Peppo, creating a furry, protective bridge over the HERMIT CRAB! Peppo's eyes bugged out.... he saw enormous creatures, inbound, all seemed to be aimed directly at HIM! Hans reached the Hermit Crab & his rescuers mere seconds ahead of the falling pile of runners. He stood over Peppo and his friends, bracing himself for the impact. The pile of Terriers rolled and tumbled to a stop, almost at Hans' feet. Popping up, they shook themselves off, laughing, joking, and patting each other on the shoulder. Seeing the VERY tiny purpose for the 'group crash', they paused to greet the newcomer. Everyone was sprawled in the sand, visiting and catching their breath...... when they heard the noise!! Looking up, they saw Austin Bad Pup, Oliver K., Allie G., Brindie L., and Black Jack F. out on the water on jet skis !!! They pivoted, they played 'chicken', they flipped, they created 'rooster tails' with the water..... then, all together, they headed for the beach, where they were greeted by the entire crowd of Terriers and their friends. Everyone wanted a turn. Vangie stepped up and calmed the eager crowd. "Look out there, " she instructed, pointing out on the water. Another jet ski was inbound, but this one was pulling several LARGE Navy pontoon rafts. As the jet ski neared, everyone recognized Captain Scotty. He pulled up alongside the othe jet skis, then had the Guardians help attach one of the large pontoon rafts behind each jet ski. Excitement was building, the Terriers knew things were about to get REALLY exciting. They waited...... and watched intently. Finishing with the rafts, Captain Scotty addressed the crowd. "Okay, you're all going to get a little NAVY SEAL training today!!" Excited clapping, gasps of delight.... This was TERRIER type of FUN!! Captain Scotty continued. "We'll put 15-20 Terriers to a raft... a Guardian will be in each raft. When we get started, we'll be moving along at HIGH speed. YOUR task, when it's YOUR TURN, is to move to the edge of the raft, lay atop that big pontoon......and when you're tapped on the shoulder, you'll ROLLLLLLLL off the pontoon, into the water..... while the jet ski is traveling at TOP SPEED!" Gasps were heard, faces showed no small amount of shock! Austin stepped up. "Nothing TO IT!! We've GOT this, Terriers!! If the Seals can do it..... we're a CINCH!!" Hunter stepped up...."Come on, LADS!! Let's show 'em how it's done!" He hid a smile as the boys popped up, eager for ANYthing that involved competition!! Vangie, slipping a wink at Hunter, responded in kind. "Scottish Lasses NEVER turn down an adventure!! We just hope the water doesn't melt your SWAGGER, Gentlemen!!" The brags were exchanged, the boasts were thrown back and forth..... the challenge was accepted. "One more thing," Captain Scottie interrupted. "Once you're in the water, you'll want to get ONTO the next raft coming along behind you." "NOTHING to it! That's EASY!" the Terriers shouted. Captain Scotty smiled, and added, "Did I mention..... that pick-up raft will ALSO be traveling along at a brisk pace..... you'll need to grab one of the tow ropes he'll be pulling along behind the raft. Then they'll pull you in! Just be sure..... NO ONE goes OUT without their LIFE JACKETS!" Captain Scotty and the Guardians spent the next half hour harnessing each Terrier up in a life jacket, and assigning each to a raft. Once everyone was aboard, and all equipment had been triple checked, Captain Scotty raised his hand. Everyone held their breath..... as his hand came down, the jet skis roared to life and leaped out into the surf, heading to open water. The long tow ropes on each raft gave the rafters a few seconds of anticipation before they were JERKED forward, flying over the waves. Captain Scotty was in communication with the drivers of the jet skis..... first, they gave the rafters a ride with long, sweeping turns, to get the passengers accustomed to the bouncing and bucking of the rafts. As they became more comfortable, Captain Scotty increased speed, and began doing more challenging maneuvers. Now, the Guardians on each raft were hard pressed to keep their passengers under control. ECMick and WCMick had teamed up and were trying to ride each wave with their paws over their heads.... often bouncing them 4-5 FEET up off the raft before slamming back down. Wild laughter was heard as everyone began to relish the adventure. Feebs B., Cher Bear K., Zoey, Chelsea B., Mandy H., Lucy and Lucytu, and Marigold M. had given up worrying about keeping their fur well-groomed. 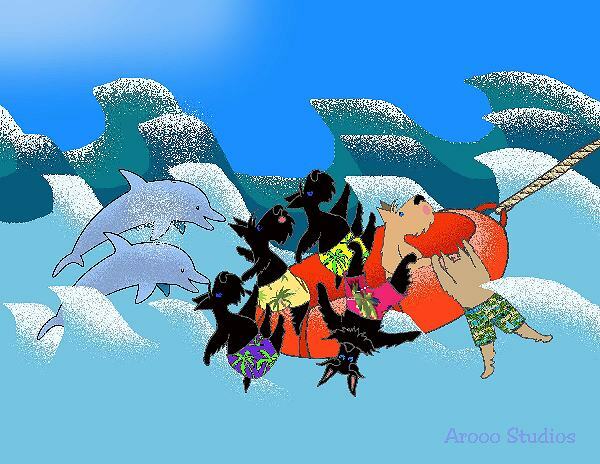 They leaned well forward in their raft as it bounced up off the waves, again and again, their muzzles into the wind, ears back, beards plastered against their muzzles, the salt spray drenching them completely... eyes shining, huge smiles on their faces, this was FUN!!!!!! Captain Scotty was ready. He gave the signal. In each raft, the first Terrier eagerly scrambled up onto the side of the raft, belly flat on the pontoon, gazing intently at the water, waiting. Almost as one, each Guardian tapped their first swimmer.... Homer D. rolled off the pontoon to his left, smooth as silk, hitting the water on his back. He bobbed up, waved a paw overhead, and issued a loud ARRROOOO! One raft back, Darby peeled off of the raft like a pro, slipping into the water with a bold splash. Another wave of the paw.... then each swimmer immediately turned their attention to the raft quickly approaching from behind. The rafts sped by, the ropes dancing out behind. The swimmers, so intent on their mission, didn't notice that the 'pickup' rafts slowed ever so slightly, to guarantee a smooth grab of the tow rope. Going smoothly now, Captain Scotty watched as 90+ swimmers rolled OFF the rafts, into the water, sometimes gracefully.....sometimes with a CREATIVE entry into the water..... but always with the ever vigilant eyes of the Guardians. After everyone had completed the first pass, rolling OFF the raft, and successfully catching the PICK UP rope of the following raft.... Captain Scotty heard it...... "DO IT AGAIN!! LET'S GO AGAIN!" A large crowd had gathered along the beach... amazed at the daring acrobatics being performed out on the water. They clapped, they cheered, they whistled at the bold maneuvers being performed. SUDDENLY, the crowd on the beach became aware of MORE engine noises. Looking around, they saw 4 speedboats approaching the jet skis.... approaching FAST!! The speedboats were pulling PARASAILS!! Looking closer, the crowd on the beach realized that the Parasails were TANDEM, there were TWO on each PARASAIL!! 2 - 3 - 4..5 .. 6 - 7 - 8 - 9 !!!!!!!!!! NINE parasailers !!! Now, the Terriers on the rafts also noticed the approaching Parasailng fliers. They watched as the speedboats drew very close, then slowed, allowing the Parasails to gently settle right down near the water. It was just before the Parasails reached the water, that the Terriers realized WHO they were watching!! "It's the CRAZY 8 + 1 !! LOOOK! There's Scarlett, waving!! SEE! And, there's Gromit, Maggie B., Happy Jack, Striker M., Jaimie S., Ziggy Stardust, and Hot Rod....... and JEB!!! LOOOK!!!" Everyone watched, amazed, as the 9 Parasailers reached up and unhooked their harnesses, slipping easily out of their Parasailing harnesses, to fall the 6-8' to the water. Immediately, the BASH rafts moved in and pulled the Parasailers out of the water. Excited greetings, pats on the back, applause, congratulations..... everyone was glad to see their wanderers back 'home'..... even Captain Scotty, who did mumble to himself something about a 'flashy entrance'!! Hmmmmmmmmmm, I'd imagine our intrepid BASH partiers are tired and worn out..... ya THINK????????? "But, it's the RIVIERA!" Maddie exclaimed. "It's expected!" Cher Bear put her paws on her hips, smiled broadly, and voiced her approval. "Of COURSE, it's expected!" Spreading her paws wide, she beamed proudly. "ALLLLL of this...... is expected!" ALLLL of the lasses from the BASH were there, none wanted to miss THIS get-together, not for ANYTHING! Cher Bear's gesture drew everyone's attention to their surroundings... they stood in the 1450sq ft. master wing of the MOST expensive Villa on the French Riviera. "Villa d'Azur", with its 23 bedrooms and 16 bathrooms, was now home to the Terriers of the BASH, thanks to Harmony D.'s generous credit card. Cher Bear stepped over, wrapped a paw through Harmony's arm, and drew her toward the wide expansive balcony just past the open French doors. Gesturing, Cher Bear drew everyone's attention to the view beyond.... a breath-taking panorama of the Mediterranean, its turquoise water seeming to blend seamlessly with the lapis sky. "HERE........" Cher Bear turned back to the lasses, "it IS expected!!! NOW, let's get TO IT! We have over 300 styles of couture bikinis waiting.. all for you! Find the bikini that SPEAKS to you .... so we can spend this day out THERE... in the sand and sun!!" Gleefully, the lasses turned and followed Cher Bear through the broadly arched doorway, to the Dressing Pavilion... an elaborate series of rooms, devoted to seasonal closets, plush settees in a vast dressing room, and a magnificently elaborate, marble bathroom suite. With room to spare, the lasses gasped at the wide array of bikinis, spread out for their selection. Assistants from the great design houses of Europe were there, to offer help, and provide expert evaluation for the 'best selection' possible. Roxi McD slowly surveyed the swimsuits, sometimes gently touching the fabric, sometimes just admiring the color.... wondering if it suited her coloring. She smiled as she sighted a particularly fetching bikini..... yes, it was 'calling her name'.... she scooped it up and held it up in front of her. Vangie stepped over, tilted her head slightly, squinted her eyes, and pursed her lips. She finally nodded enthusiastically. "PERFECT!" Vangie proclaimed. As Roxi dashed off to change, Vangie spotted her OWN 'favorite' bikini. She chuckled to herself as she picked up the 'yellow, polka-dot bikini' laid out on a nearby chaise lounge. Scarlett saw Vange racing off to change, a yellow bikini fluttering from one paw. Scarlett moved through the swimsuits.....she was hunting something specific... no, not that one..... nope, not that either..... nuh unh... no.... THERE! She hurried over, then slowly picked up the rich, scarlet bikini. "It's MEEEEEEE!" she happily announced, and hurried after the others. Lady, Clio, Bella, and Grace joined the party, reluctantly at first, but were reassured by the special assistants that there were suits specifically for the Guardian ladies. Megan Daisy stepped out of the changing room, twirling around in her new purple bikini. Marigold was right behind her, striking poses in her..... yes, marigold-colored suit. Chelsea's suit was a rich, deep mauve..... Minnie's was a soft mint green... Mayzie's was a deep, muted gold, with threads of shimmering copper woven into the fabric... Mandy beamed as she stepped out in a vibrant violet and pale lavender plaid bikini....Brindie modeled her neon blue bikini, boldly swirling to show off its shimmery fabric. Bijou's bikini was black and silver plaid, with a red stripe woven through the design. Tana's bikini was a shimmering silver, striking in its design. One after another, each of the BASH lasses made their selections, and within an hour, the Dressing Pavilion resembled the half-price table at an Outlet mall... discarded swimsuits tossed about, clothes strewn far and wide... obvious signs of a successful shopping expedition. Dressed for the French Riviera, the BASH lasses hurried down the wide terrace, across the gardens, and down the expansive, stone stairway to the private beach. Seeing the BASH lads already on the beach, the lasses slowed, making a slow, grand entrance.... as if planned, each lass did a well-executed model's pirouette as she stepped off the stone steps onto the beach. The lads were dumb-struck.... and the lasses were enjoying every MINUTE of it! Once everyone had gotten past the initial 'bikini shock', the BASH partiers began to take advantage of their own, private beach. Finn B., Taillur, Montgomery W., Dewey S., Jack McD., Campbell B., and Patrick V. immediately took possession of the dozen jet skis moored at the shoreline, and spent the afternoon performing aerobatics and trying to out-do each other with more and more difficult maneuvers. Zip B., Tucker K., Morghie H., Caileigh F., Ceilidh, Snowy R., and Mason B. 'discovered' a fleet of dune buggies, conveniently parked at the far end of the private Riviera beach. The race TO the dune buggies was an event in and of itself.....the play truly began once the dune buggies roared to life, with much pushing and bumping and Scottie competitiveness. 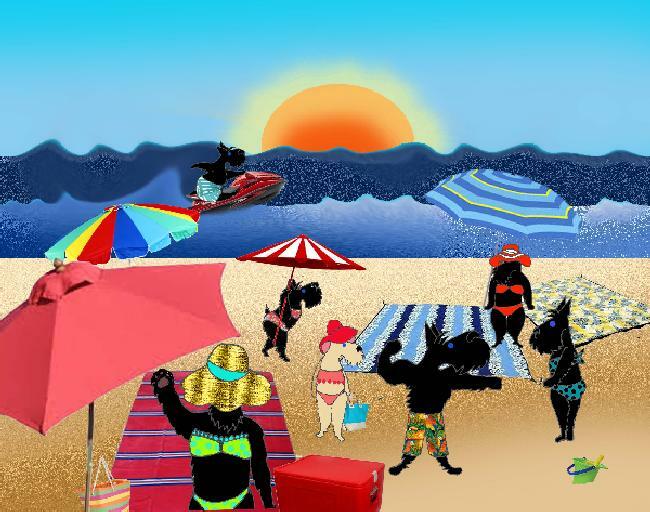 Across the beach, the BASH lads and lasses played, laughed, soaking in the Riviera sun and........ welllllllll, we CAN report that they are having a GRAND time.... more than that, I am not at liberty to reveal. I CAN say..... they're taking LOTS of 'Selfies' and making LOTS of cell phone calls!!! MORE later..... now... it's PLAYTIME!!! The sun rose, bright and warm on this last day of the French Riviera Beach party. After a full day on the beach yesterday, the Terriers had partied late into the night, dancing and taking advantage of the sumptuous buffet. Yet, the Terriers were already up and stirring this morning, determined to not waste a MOMENT of this last day. Another table, laden with every breakfast delicacy a Terrier could imagine, greeted them on the villa's wide veranda as they stepped out to begin their day. Much laughter, teasing, and boasting was heard as the BASH partiers broke their fast and prepared for another wild day on the Riviera. Vangie could tell when everyone had finished breakfast.... chairs were pushed back, paws were stretched out, groans and grunts of utter contentment were heard. Conversation slowed.... looked like everyone was headed for another naptime! "ALLLLLLL RIGHT, party pups! LAST day here on the Riviera.... SURELY, ya don't want to spend it napping in a lounge chair like an..... ELDER!" Vangie teased. She turned to look at Riley, who was comfortably settled in a VERY plush chaise in a shady corner of the veranda. She smiled lovingly as he arched an eyebrow, then leaned over to the wheeled serving cart that had been FILLED with treats and goodies.... and had been parked right beside his chair. He raised a croissant to her in salute, then took a hearty bite of the tasty treat. "Come with ME!" Vangie ordered, as she turned and walked back down to their private beach. The Terriers grunted and mumbled, but their curiosity was stirred now, so they weren't about to miss whatever Vangie had up her sleeve THIS time. She didn't glance back, she KNEW they were following, she heard the growing eagerness. With a wave of her paw to further prod the group onward, she sped up the pace. Everyone sprinted forward to greet their guests.... they KNEW who these ladies were....Misti May and Kerri Walsh, the Olympic Beach Volleyball GOLD MEDALISTS! Vangie formally introduced their guests for the day... then,after the autographs and greetings were done, Vangie explained the day's agenda. "We're going to have a beach volleyball game..... Terriers vs. MAY & WALSH!!" Dead silence... then "uh oh" and "Uhhhhhhhhhhh........" along with some "you AREN'T SERIOUS!!" Misti May and Kerri Walsh, standing beside Vangie, tried to hid their grins. Vangie stood up taller, squared her shoulders.... and directed an intense gaze at her Terrier pals. "Get a GRIP, Terriers!! SURELY, you don't have a problem with the odds......... 2 against 30!!! We can substitute in as often as we want, we can play 30 at a time..... against 2 lone gals!!!" She slipped a wink to the Olympians, then continued her build up. It didn't take much......the Terrier Tenacity immediately kicked in. Vangie spotted it immediately, the swagger, the erect tail, legs braced...... yep....... they were ready!! The Terriers cheered loudly as their volleyball team took to the sand. Homer D., Striker M., WCMick, Austin Bad Pup, Samurai Ryu the c@t, Truman H., Archie B., Monte R., Mayzie H., Megan Daisy, Alanagh, Clio, Caiti, Black Jack, and Snowy R. took the court as the 'starters'. Vangie scanned the group..... then motioned quickly for the Guardians. She moved Quinn, the Harlequin Great Dane to the net, moving Snowy to the middle row. Smiling, Vangie lined the net..... Jeb, Lady, Alice, Hans, Bella, and Riley the Border Collie, who at 1.5 yrs of age, was in constant motion, with SCARY jumping height. "PLAY BALL!" Vangie called, stepping back off the court. Misti May wasted no time. She wanted the Terriers to take the game seriously. Her serve was lethal. The volleyball arched, then dropped like a rock, angling down between Clio and Snowy. "WOW!" said Snowy. "That almost HIT ME!" Quinn stepped back, leaned down, and whispered... "that's why you put your PAWS up to hit it BACK to 'em!!" Misti scored the next 5 points just as quickly. Misti stepped up to the net, bent down, and gave some advice. "The volleyball is a huge TENNIS BALL. It MUST not TOUCH the GROUND. It MUST be hit back over the net to US. You want US to miss the ball. YOU want to hit the ball back over the net..... EVERY TIME! You want to hit it so we CAN'T hit it back! " It was obvious that the LIGHT had come on... "AHHHHHHHHHHH!! OKAY!!" Misti went back and served again. The Terriers raced for the ball... Caiti hit it straight up with her paw.... it landed on WCMick's head. He immediately knocked it into the air with his muzzle.....and was amazed that it went over the net, falling at Kerri's feet. Seeing the excitement from getting the ball into the sand, on the OTHER side of the net, the Terriers renewed their efforts. Enthusiasm was contagious...... and now, it was the TERRIERS' serve!!! Striker had been watching Misti closely, as she served. He stepped back, held the ball in his paw, and with a bold back-pawed swing, he WALLOPED the volleyball. The ball rose high into the air, arced and began a downward trajectory, increasing speed as it fell. Kerri smoothly stepped over and volleyed the ball, setting it up for Misti, at the net, to drive the ball back over the net. "SET UP!!" Megan Daisy screamed. "Get READY!" The Terriers, teeth gritted, all eyes focused on the volleyball as if it were some wayward squirrel scampering to its doom. Misti leaped up and power-slammed the volleyball over the net, in a lethal, 'straight-down' angle. Caiti saw it coming, seemed to aim directly at her. Eyes wide, she braced her back legs, and watched it. 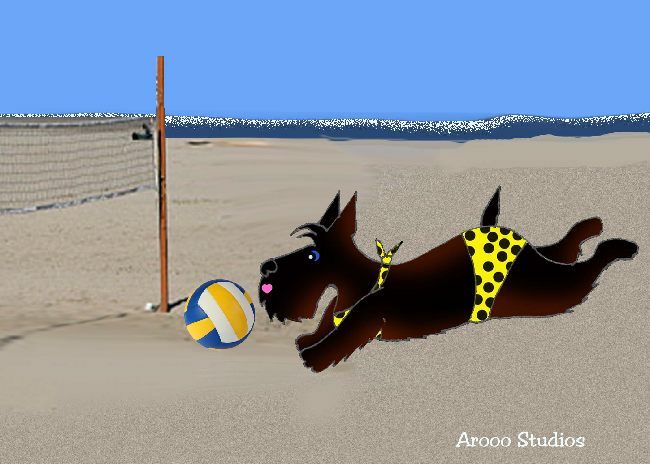 She saw it as if it were in slow motion... her paws whipped out to intercept the volleyball. With a sharp slap, Caiti sent the ball straight up into the air. Alanagh stepped in and volleyed the ball to Lady, at the net. Lady leaped up, and with a swift pop, sent the ball back over the net.... to drop harmlessly into the sand between the Olympic champions. Striker retrieved the ball, and stepped back for another serve. "Hmmmmmmm, how about putting a little SCOTTIE flourish on this serve," he mumbled to himself. The Terriers watched suspiciously as Striker placed the ball in the sand, right at the backline. He turned to face the bleachers, his back to the court. Glancing behind, he adjust his stance, putting his back paws right at the volleyball. Satisfied, he looked back at the bleachers, and flashed a broad smile. 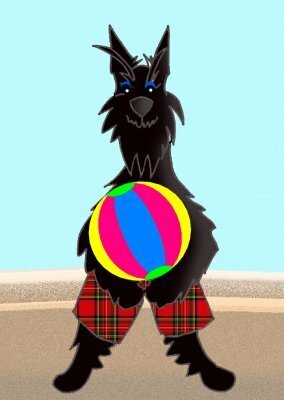 THEN, Striker performed the famous "Scottie SHUFFLE"!!! THIS time, however, his left rear paw connected perfectly with the volleyball, sending it on a devastating line drive, JUST over the net, flying directly at Kerri. Surprised at the maneuver, and stunned that it had actually WORKED, Kerri still reacted with catlike grace, easily volleying the ball up to the net, where Misti returned it to the Terriers' side. Samurai Ryu the c@t sleekly batted the ball up, at the last second. It rose into the air, with 10 Terriers hot on its trail. WCMick leaped forward, got a paw under it, and THWACKED it back over the net. Misti was waiting for the ball, and met it at the top of the net. 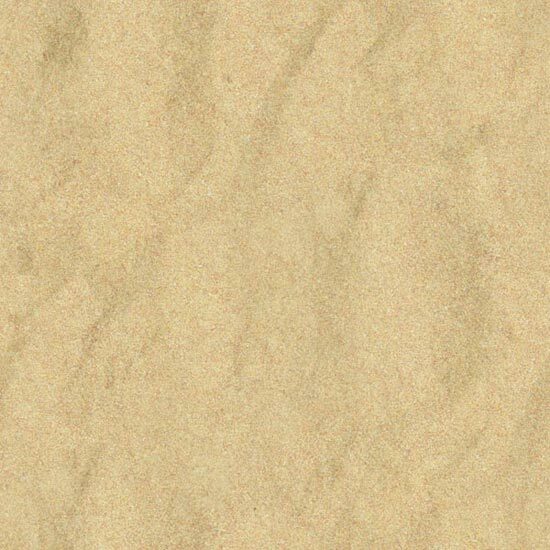 With a resounding pop, she sent the ball straight down, on the Terriers' side of the court... to fall aimlessly in the sand. "WOW!" they whispered. Looking at each other, they smiled.... "they MUST have some Terriers in their lives, to learn THAT kind of determination! The game continued.....back and forth for most of the morning. Kerri and Misti took the Terriers 'to school', as they performed jaw-dropping 'digs', and 'bump sets', and 'dinks'... the Terriers watched avidly, learning to combat the champions' maneuvers... or at least, making a Terrier effort. The Terriers, not being accustomed to activities in the sand.....and being 'short of stature', were now substituting in almost with every play. ALL of the Terriers were getting playing time on the court against the Olympians. The new, 'fresh' players came in to relieve the exhausted, panting players, who immediately plopped down on the bleachers..... gasping for breath. Vangie had just come onto the court, replacing Hot Rod Rammbler, who'd done a superb job of recovering volleys and setting up passes. She watched the Olympians closely as they served 'game point'. The Terriers were on their toes, switching their weight on their paws, ready for the serve. The ball flew over the net, it was going to fall just over the net, on the Terriers side..... Vangie saw it dropping, saw that the Terriers had backed up, expecting a longer serve. She stretched out, and achieved a perfect 'dig', saving the ball JUST before it dropped into the sand. Hunter was right there, volleying the ball across to Jeb. He leaped up and sent the ball back across the net. Misti stopped the ball just as it topped the net, sending it back into the Terriers' court, to land inside the court, just at the far, top corner. "Game.... Olympians!" announced the referee, Captain Scotty. The Terriers, although exhausted, were quite proud of themselves. They'd learned a LOT, they'd played up to the Olympians' level..... and everyone had thoroughly enjoyed themselves.... AND were now exhausted! The two teams congratulated each other, and celebrated the Volleyball Schooling with a leisurely brunch, served on an enormous table set up down the beach. Late afternoon came all too soon, as Captain Scotty rounded up his BASH partiers. The Guardians saw that everyone was packed, and had taken charge of seeing that the baggage had been sent on to the waiting ScotCorde. The buses were loaded, with the Guardians counting heads, double checking their lists. With a final nod, they notified Captain Scotty that all were present and accounted for. The BASH partiers watched the exquisite scenery speed by as the buses headed for the airport, and home. All too quickly, the partiers were stepping off the buses, and onto their legendary ScotCorde. Again, the Guardians counted heads..... Clio and Lady herding them from the buses, onto the jet... Jeb and Hans double-checking the list as they entered the main cabin. Captain Scotty clicked the cabin mike .... "TALLY HOOOOO!" he shouted, a definite smile in his voice. The Scotcorde LEAPED forward, increasing speed at a breath-taking pace... then left the ground at a jaw-dropping angle, and climbed skyward. Reaching cruising altitude, Captain Scotty again clicked the cabin mike. "OKAY, BASH adventurers. Your day isn't QUITE over yet. We have a BIRTHDAY to celebrate!! Truman H. is 9 years old today! You now have the entire flight home..... to help Truman celebrate! You'd best get TO IT!!" The Guardians rolled their eyes. MORE partying...... oh, good!! They moved up and down the aisle, serving cake and ice cream, handing out birthday hats and noisemakers (WHO thought up THIS item?!!?! VEG) The party was long..... and loud. Truman had a superb birthday party, at 35,000ft, with all of his friends. Captain Scotty smiled, as he listened to the happy Terriers, partying the miles away. As the hours passed, the party noises faded, to be replaced by the soft sounds of sleeping Terriers..... the week-end on the Riviera was grand, they'd had a LOT of fun. Now, quiet for the first time in days, their 'tired' had caught up with them. He smiled to himself...... another successful BASH. He quietly lowered the landing gear as he approached the first stop in delivering the Terriers home again. And, the week-end on the French Riviera?? Welllllllllll, let's just say...... what HAPPENS on the Riviera, STAYS on the Riviera!! !